Blast from the Past ! 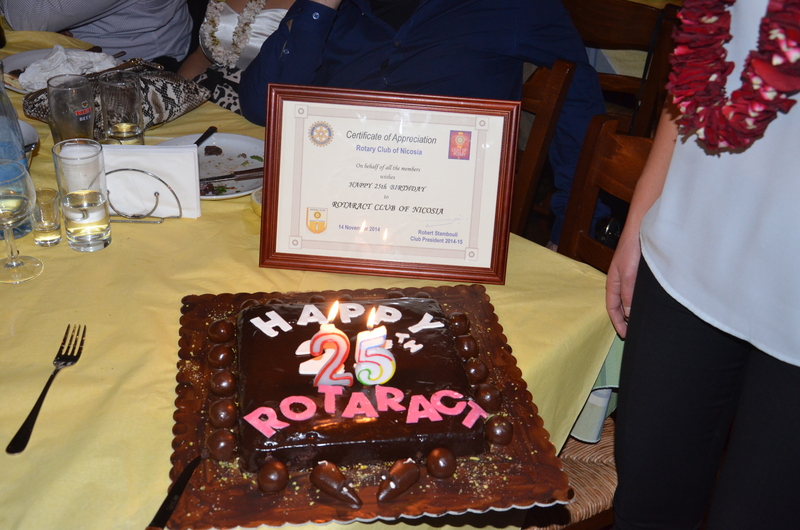 Rotaract Club of Nicosia celebrated its 25th Birthday Party at “Pireos 17” in Nicosia. During the night we had the honour of receiving a certificate of appreciation for our 25th years in service , from our mother club Rotary President Mr. Stamboulis. Also the pinning of two new members took place, while Past Presidents and friends of our club join us in a night full of live music , dancing and great food. We promise that Rotaract Club of Nicosia will continue to serve above self, and give back to our community for many more years !!!! Thank you all for supporting us ! This interactive conference is for anyone between the ages of 17 to 30, who is interested in working with others to solve the problems in our society, such as unemployment and hunger. Participants will be inspired by keynote speakers, and activity leaders. Participants will be assisted by experienced mentors to develop and present their ideas. This event is hosted by Cyprus Rotary and is free of charge. It will be held at the European University, and conducted in English. Participants will receive a certificate of attendance. Η διαδραστική αυτή ημερίδα απευθύνεται σε νέους ηλικίας 17 έως 30, που ενδιαφέρονται να βιώσουν την εμπειρία της αλληλο-συνεργασίας και της ομαδικότητας για να προτείνουν λύσεις στα προβλήματα της κοινωνίας μας, όπως την ανεργία και την πείνα. Οι Ομιλητές, και ομαδάρχες θα εμπνεύσουν τους συμμετέχοντες που με την βοήθεια έμπειρων συμβούλων θα αναπτύξουν και θα παρουσιάσουν τις ιδέες τους στο τελευταίο μέρος του Συνεδρίου. Η Ημερίδα αυτή φιλοξενείται από την Κυπριακό Ρόταρυ και η συμμετοχή είναι δωρεάν. Θα πραγματοποιηθεί στο Ευρωπαϊκό Πανεπιστήμιο Κύπρου, και θα είναι στην αγγλική γλώσσα. Οι συμμετέχοντες θα λάβουν πιστοποιητικό παρακολούθησης. Οι ενδιαφερόμενοι παρακαλούνται να επικοινωνήσουν με το 99431228 ή στο email aleen@peopleachieve.com και να συμπληρώσουν την αίτηση εγγραφής. On Sunday 19th January 2014 an excellent fundraising dinner was organised in favor of The Polio Eradication Programme of Rotary International. The dinner was held under the auspices of His Excellency the President of the Republic Nicos Anastasiades. District Governor Jamil Mouawad attended the dinner with his spouse along with many Rotarians and Rotaractors from our Club and the other Clubs of Cyprus . From the event an amount of EURO 6.000 was raised to help towards the eradication of Polio. World is now 99 % polio free thanks to Rotary! On Thursday 16.01.2014, District (2452) Governor Jamil Mouawad met with all the Nicosia Rotaract clubs to discuss the past, present and of course the future of Rotaract and Rotary. Rotaract Club of Nicosia, Rotaract Club Nicosia Aspelia, Rotaract Club Nicosia Ledra and Rotaract Nicosia Lefkothea had a great discussion with the Governor regarding Rotary/ Rotaract issues. Thank you District Governor Jamil Mouawad for a truly inspiring meeting!! Dear Rotaractors and friends a fruitful year has come to an end an the results are in………. This blog got more than 2,800 views in 2013 (400 more than last year). We would like to thank all of you for your support and hope you enjoy reading about Rotaract Nicosia even more in 2014!!! Rotary Club Nicosia President Mr Anthony Thomas Ashiotis organized a pool party in cooperation with Rotary Club Nicosia and Rotaract Club Nicosia. Arround 100 Members and friends from various clubs attended the party, enjoyed a night of fine drinks, good food and great company whilst at the same time managing to raise about 1410 euro (double the original target). All proceeds from the event will go to the excellent cause ‘ANGALIAZO ‘ a charity which helps on a daily basis poor families of our community who are in much need of food and other means of support. A big BRAVO goes to our Rotary Club President for hosting this great event and to everyone of the Rotarians, Rotaractors and friends that assisted in making the evening a big success!! 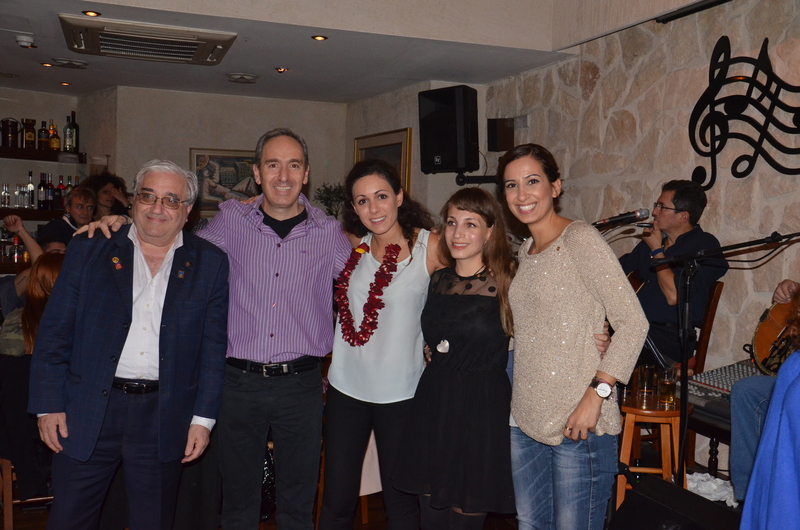 On 13 June, the Rotaract Club Nicosia held its handover ceremony, in the yard of Octana, in the old town of Nicosia. Under a starry sky, the presence of members and friends of the Club and Rotaratians helped to create a beautiful and festive atmosphere. Glafkos Mitsidis, President of the club for two consecutive years, 2011-2012 and 2012-2013, thanked the attendees and members of the Club and handed over the wheel to Niovi Georgiade, President for 2013-2014. Glafkos gave a brief review of the year and gave the floor to Rotary President, Anthony Ashiotis and to Rotary – Rotaract liaison officer, Louis Thoma, who in their turn thanked Glafkos for all the excellent work during the past few years and wished for a good cooperation for the new year. The new President presented the new board and committee officers (Past President: Glafkos Mitsidis, Vice President: Antonia Hadjicosta, Secretary & International Projects Officer: Evie Christodoulou, Professional Development Officer: Anna Maria Leotsakou, Club Service officer: Charalambos Koutrouzas, Community Service Officer: Antonis Savva and PR and Social Media Officer: Mae Mavroudis) and announced the pinning of two new members of the club, Agis Eliades and Maria Ioannidou. At the handover ceremony, it was with great pleasure that members of the Rotaract Clubs Kition and Ledra were hosted, as well from the Rotary Club Aspelia. The night evolved beautifully, with wine and smiles among the, approximately, 40 attendees. On the 27th of February the Rotary Club of Nicosia has organized an Island Wide Peace Event, which took place at the European’s University, Cultural Centre. The event started with a display of herbal teas, herbal products and sweets as well as Turkish delights, which all the attendees have enjoyed enormously as a way of warming up the atmosphere before the film, and show how the two communities can work harmoniously under the Rotary umbrella. The film has received many awards and has made an impact to the people, who have seen it. A fruitful discussion followed with ideas of presenting the film again with more focus on Youth and the Rotaractors. More than 150 Rotarians and friends have attended from all over the island. 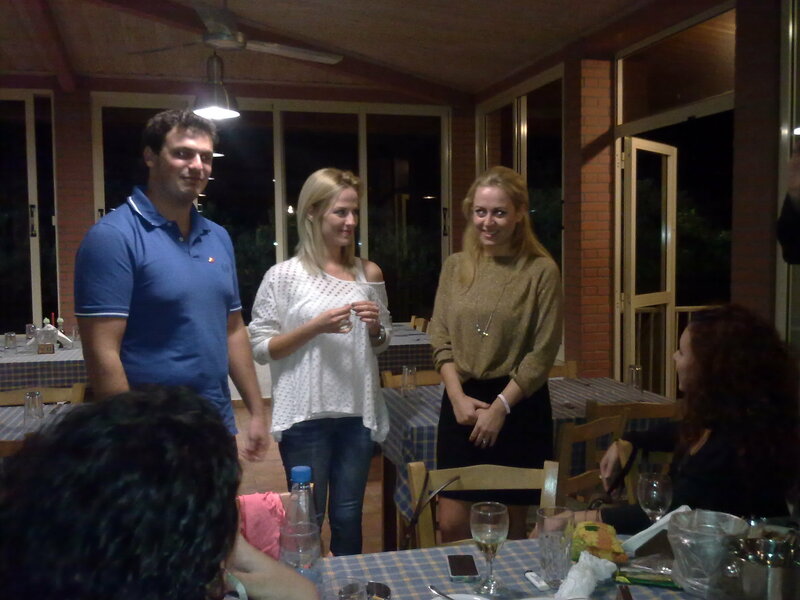 Rotaractors gathered from Clubs all over Cyprus to share a beautiful experience during the Fellowship Weekend that took place at Agros on the second weekend of January. Of course Rotaract Club of Nicosia members made a strong presence, as they were catalytic in the organization of this event and were assisted by the generosity of our sponsoring Rotary Club of Nicosia. On the 12th of January a group of 30 Rotaractors met at Rodon Hotel in Agros to spend the weekend together, get to know each other better and create bonds between our Rotaract Clubs. On this ice-cold day the programme started with a rich lunch and some village wine at Kyriacos Tavern to warm us up and break the ice between those of us who had not met before. With the ice broken we then went back to the hotel, where Mr. Peter Harsh made an interesting presentation about Rotaract, the roles of the Board members and gave some answers to the participant’s questions. The day finished with dinner at the hotel and some fun games enjoyed by all the attendees. Following Sunday morning breakfast, the group visited the Tsolakis House of Roses, where we found out the production procedure of rosewater and other relevant products, such as soaps, liqueurs and candles. The Agros fellowship completed with a last stop at Niki’s sweets, just to sweeten our Sunday melancholic afternoon and the sad end to what was described by all as a successful Fellowship Weekend. Rotaract Club Nicosia held their first club meeting on 15 January 2013 at Seven Lounge bar and had the opportunity to celebrate the coming of 2013 with the Club’s traditional cutting of the Vassilopita along with our honoured guests Mrs Maria Christopoulou (Chairperson of District RYLA 2013) Mr Louis Thoma (our Rotary Liaison) and Mr Anthony Ashiotis (Incoming President of Rotary Nicosia). During our meeting and amongst other things on the agenda Niovi Georgiade our Club Secretary made a short presentation about the activities and presentation our Rotaractors attended during the Agros Fellowship. With three new prospective members around we had the opportunity to inform them about Rotaract and give them an insight into who we are and what we do but also get to know them better. The cutting of the traditional Vassilopita found our Rotary Liaison Mr Louis Thoma as the lucky person to find the flouri (a small medallion of luck for the year) with other members of our Club as well as a few prospective members winning bottles of red wine as presents. Overall our Club Members and Guests welcomed the new year with joy and spirit(s) . On behalf of Rotaract Club of Nicosia we hope that you all have a great year with many rewards ! This blog got about 2,400 views in 2012. We would like to thank all of you for your support and hope you enjoy reading about Rotaract Nicosia even more in 2013!!! On Saturday 10th November RAC Nicosia Past Presidents, Rotarians, friends & guests from other Rotaract Clubs and of course our VDRR joined us @ Retro Club in Nicosia to party ….80’s and 90’s style and countdown the moments to midnight. It was with great joy that a few minutes after the stroke of midnight, along with Past Presidents of our Club (as is our Club’s tradition) we blew out the candles on our birthday cake…. in a burst of cheering and wishes. As we look back at our Clubs’ past, it is with great pride for its achievements. This pride fills us with strength and hope for our Clubs’ future but at the same time with a sense of responsibility and duty to strive further. 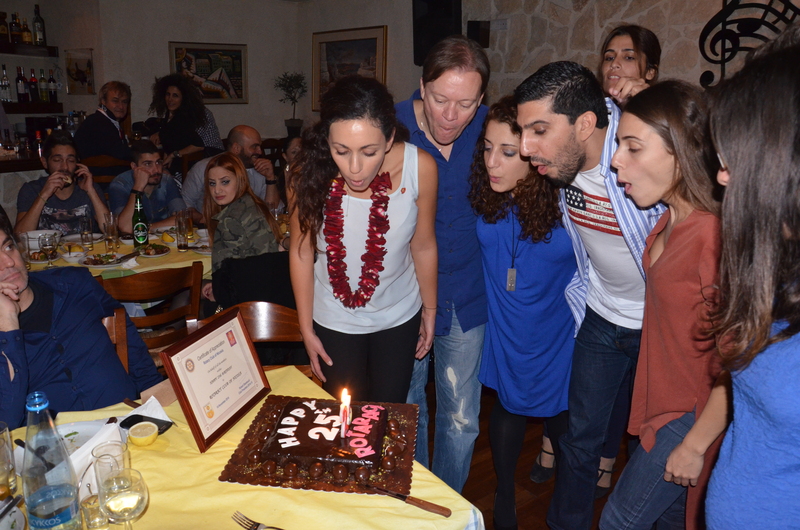 Happy 23rd birthday Rotaract Nicosia !! Rotartact Club of Nicosia organized a team building weekend in Cavo Maris Beach Hotel in Protaras on 12 &13 of October 2012. The aim of this event was to improve communication between the members and learn about one’s strengths and weaknesses through various activities and ice breakers. At the first day we did some exercises consisting of a variety of tasks designed to develop group members and their ability to work together effectively. Some of the activities were the blind folding and the Guess who Game. Most of the games helped us see how other members see us, how the team works together and discover better methods of communication. 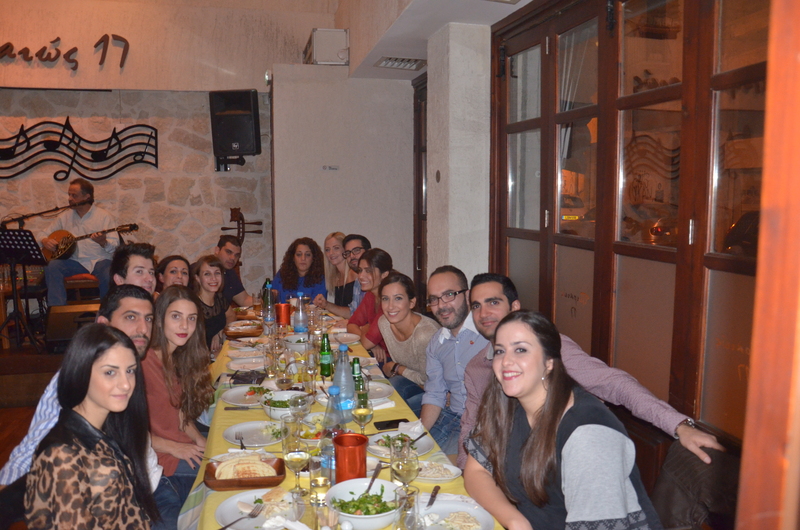 On Saturday night we all went out to Spartiatis Taverna to enjoy the fish mezedes and good wine. Taking the opportunity of this fellowship weekend we also celebrated the addition of one more Rotaract member to our Club. At the end of our dinner we all raised our glasses to welcome Mae Mavroudi as the newest member of our Club as a reward for her dedication and efforts throughout the previous months . Welcome to our Club and the Rotaract family Mae !! We ended up spending the second day (Sunday) with social activities that encouraged members to spend time together and get to know each other better. Overall it was a relaxing and the same time learning experience for all of us! On this warm night of the 7th of September, Rotaractors from around Cyprus gathered at Chateau Status in Nicosia to welcome our District Governor, Kevork Mahdessian and took the opportunity to present our respective Rotaract Club’s to him. Impressed by the presentations and the good work displayed by all Rotaractors he wished us the very best in our new endeavours and stressed the importance of fulfilling the message of the 2012-13 theme of the RI President Tanaka , “Peace Through Service”. We all thanked him for his presence and advice and invited him to join us at the garden area of Chateau Status to enjoy a glass of wine, an excellent choice of finger food and of course our good company. 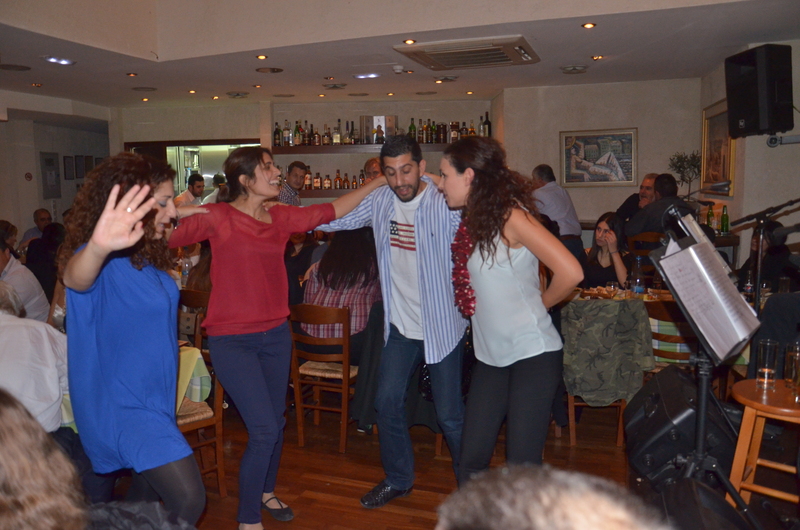 Rotaract Club of Nicosia would like to thank the organising committee for their excellent organisation of the night! It was with great joy that we held our Handover Dinner on Wednesday, 20th June. The venue of our dinner/handover was at Mediterranean Restaurant (http://www.mediterraneancy.com/), where we all enjoyed a fun night, of getting together and celebrating our Club’s achievements of the 2011 -2012 period for the last time before the New Rotary Year began. We were particularly glad to have with us Mrs Yioula Papakyirakou, our sponsoring Rotary Club’s President for 2012 -2013, District AG Maria Christopoulou and Rotaract – Rotary Liaison Mr Louis Thoma for yet another one of our events, confirming that the solid Rotary -Rotaract relationship from the years before would continue with even greater zeal this Rotary year. During our informal Handover Dinner those Rotaractors who would not be continuing as officers this year were thanked for their work and the new Board was introduced and welcomed by all for what promises to be an even more fruitful Rotary year. Best Rotraract regards and all the very best to us all ! !